The Senator back in its better days. 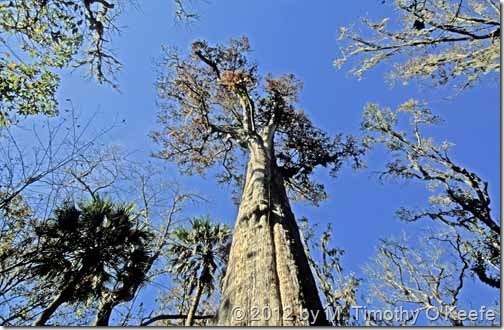 The Senator, a 3500-year old bald cypress ranked as the fifth oldest tree in the world, was killed January 16th by an arsonist. Just as I predicted weeks ago, when silly theories of a deadly lightning strike when there was no lightning or–even more asinine–that spontaneous combustion caused by the tree’s own wind-drive branches rubbing against itself were offered as plausible causes.. The Senator, located in Longwood, FL, died a stupid death. It turns out the arson was accidental, committed by a 26-year old woman who set fire to twigs and branches around the tree to better see the drugs she was taking. Once the tree caught on fire, she used her cell phone to take photos of it but did not bother to call the fire department or take any steps to end the devastation she started. Police were leisurely in arresting the meth head. Although they received a tip the day after the fire, the woman wasn’t arrested until February 28, more than a month later. How much does the judicial system value the worth of The Senator? Not much. Bail for the arsonist was a measly $5,950. The low bail amount unfortunately reflects how much Seminole County officials traditionally have respected the importance of The Senator and a nearby much younger bald cypress, the 2,000-year old Lady Liberty. Seminole County officials now willing spend money to protect—a stump? Protecting the tree while still alive might have been a better idea. Their home, Big Tree Park, years ago turned into a notorious after-dark location where drug use and prostitution were common activities. Not only was Big Tree Park allowed to turn into a seedy nighttime spot, Seminole County officials never installed any lights or security cameras and nightly police patrols didn’t seem to be part of any cop’s beat. The only protection afforded The Senator was a metal fence around its base –and that worked great, didn’t it? 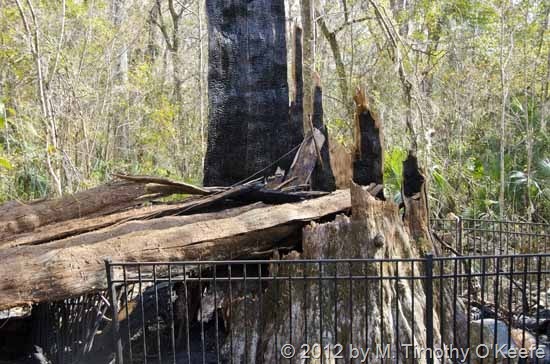 In a classic case of too little too late, Seminole County commissioners now has decided to spend $29,000 to build an 8-foot fence around The Senator’s stump and another around Lady Liberty before she becomes someone’s demolition project. Still no park lights, though, and no security cameras. As for police patrols, that remains to be seen. Indifference by officials compounded by incompetence are the real culprits for killing The Senator. The towering tree had stood for 3,500 years and like other equally ancient monuments–the pyramids of Egypt, Stonehenge–it was expected always to remain. It never seemed to occur to those in charge that living monuments might require more care and protection than stone ones. So, The Senator was disregarded and left on its own. That neglect is not only embarrassing, it’s unfathomable.